So you have switched from traditional cigarettes to E-cigarettes? Congratulations you’ve made a really great decision that would affect your life for the better. Since Electronic cigarettes do not contain any of the harmful chemicals that traditional cigarettes have, in just a few weeks you can see some major changes in you. Your teeth become whiter, you have more energy, your skin become smoother just to name a few changes you will experience. But do you know that your physical appearance and fitness is not the only thing that will change? When you switched to V2 cigs, your mind and soul is also affected therefore getting a new sets of habits. Habits that vapers all over the world can relate with. 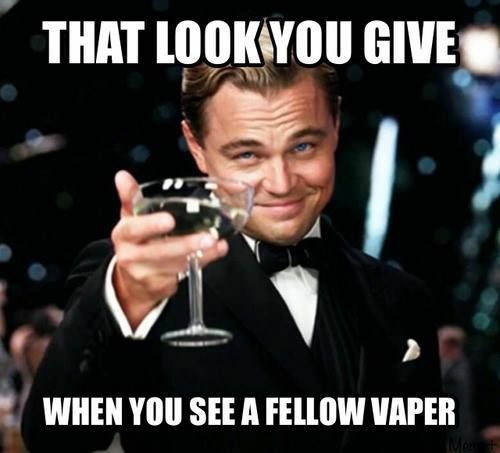 So you know you’re are a vaper when you. Choose a meal that can complement the flavor you are vaping. Like a good ol’ American steak would be great with the V2 cigs cola flavor. A french cuisine would be great with a Greensmoke Vanilla flavor and if you are having a coffee, a chocolate flavor one would be perfect for it. Know the E-cigarettes lingo such as cartomizer, cartridges, E-liquids, Mods and more. Tasted more than a dozen ecig flavors and probably have a stock of your favorite ones in your house. Always check all your ecig stuffs – batteries, flavor cartridges, portable charging carry case etc – and make sure you’ve got everything you need before you leave the house. Then you just realize you forgot your car keys. Consciously count your puffs so that you’ll know when you’re ecigarettes need recharging or flavor cartridges need replacing or refilling. This does not apply to some ecigs like the V2 ex series as it already has a puff counter. Your phone battery just died but you choose to charge it later as your ecig battery is still charging. Vaping is more important than phone calls anyway. Get excited everytime you get a notification that your vape mail already arrived and you rush to your mail as soon as you can – even making up an excuse to leave work early so you can get home to your new e cigarettes stock. Always stock up with flavors, batteries and accessories (using a 50% off discount coupon and when people tell you that you are a crazy hoarder, you say you’re not. You’re just a collector and a lover. Regularly visits ecigarette brands website/blog to check on the latest news about the products and more importantly, to know when will the next storewide sale is happening or if there are new ecig coupons and discounts available. You can relate to any of these points and add your own in the comments below!